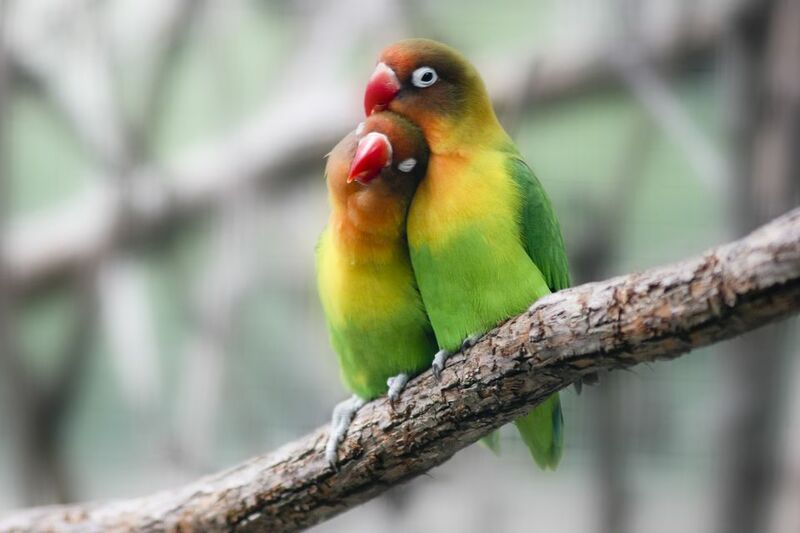 Lovebirds are a small type of parrot that are green in the wild but have many color mutations in varieties that are bred as pets. They have a long, hooked beak and a short, blunt tail. Lovebirds get their name from their tendency to form monogamous bonds that can last their entire lifetime. Males and females look alike. While they are affectionate to their mates, they are territorial and aggressive to others they view as intruders, like other birds in the household. To breed successfully, each breeding lovebird should be healthy and between one and five years old. Lovebirds need a nest box in which to lay their eggs. The proper size nest for a lovebird is about 12 inches on each side, with an entrance hole about three inches in diameter. Proper nesting material, such as shredded paper, should fill the nest box. Like all hookbills, lovebirds should be fed a varied diet consisting of seeds, pellets and fresh fruits and vegetables. Breeding-age hens should be placed on a calcium supplement to counteract the nutrients that they lose during egg-laying. Female lovebirds lay their eggs from five to 12 after mating. Many lay an egg every other day until they have all been laid. Each clutch usually contains between three and seven eggs. On average, lovebirds incubate their eggs for about 23 days. This can vary by a couple of days in either direction. When attempting to calculate future hatch dates, always count forward from the day that you notice the hen begin to sit on the eggs. Sometimes the hen won't sit until all the eggs of a clutch have been laid, and they all need equal incubation time. Most breeders allow the hen to feed the babies from hatching to the age of two or three weeks. After that, the breeders take the babies out of the nest and place them in a brooder for hand-feeding. Most lovebirds need to be hand-fed until they are between six and eight weeks old when you can begin to wean them onto millet, soft pellets, and fresh fruits and vegetables.